XML Web services make business-to-business (B2B) transactions simpler, more seamless and more efficient than ever. XML (eXtensible Markup Language), built on open industry standards that enable Internet based data transfer across any platform or application, is fast becoming the “common language” of the Web. XML is a mark-up language standardized by the World Wide Web Consortium. It provides semantics-aware markup without losing the formatting and rendering capabilities of HTML. XML’s tags capability of self-description is shifting the focus of Web communication from conventional hypertext to data interchange. XML’s extensibility allows the users and application to declare and use their own tags and attributes, ensuring the logical structure and content of semantically rich information to be retained. It focuses on the description of information structure and content as opposed to its presentation. Security can be bypassed simply by exploiting XML’s flexibility and extensibility paired with its semantics and structure. XML fragments, can present data from multiple sources. The components of an XML fragment are like baking ingredients-you mix them together in varying amounts based on a recipe. These ingredients can be spread throughout the Internet “kitchen.” This potential dispersion of information introduces validation issues. Without a reliable method of validating the source of the data and the accuracy of the information itself, a hacker could introduce spoofed data into a transaction or transformation of data. XML instances can use links to resources, making them transient in nature. With all the “ingredients” identified, XML provides you with two options: You can make the cake, by collecting and presenting the XML information in an XML instance, or you can take a picture of the cake, by providing pointers and links to the applicable information. In either case, the end result for users looks the same. A complete XML instance may be presented without any real data in it, just Uniform Resource Identifiers (URIs) that point to particular elements. This transient quality really extends the “security is only as strong as its weakest link” metaphor -it could be that you have limited control over some of the data but must still rely on the security controls surrounding it. XML is transport independent; it doesn't specify a particular transport mechanism. Current implementations use HTTP for transport-a universal skeleton key for virtually any network. Firewalls don't stop HTTP, and they won't stop XML, regardless of your application. Thus, XML can generate security problems that other forms of data do not. XML instances can look exactly the same on the surface and yet still be different in content. Even well formed syntactically correct XML instances may be structured differently due to tag placement, use of white space, and other style mechanisms. These differences, though they don't impact the quality and content of the information, introduce a level of ambiguity that adds to the need for validity and security. At the moment many XML users are unaware of these problems. They may rely on their systems integrators to address these issues but failing to address them leaves their companies extremely vulnerable. Take the example of a company with a back-office system used for procurement, ERP or day-to-day administration, using XML to integrate services direct into the server. By its nature, XML integration sits on top of the Web technology that is the focus of so many malicious attacks today. Any company exposed in this way runs the danger of revealing vital confidential data to outsiders; competitors could steal customer and supplier details or highly confidential pricing information. Revelation of this kind of material is not only commercially sensitive; it could also unleash all manner of data protection penalties. Although there have been some questions about the process used to create XML, the standard itself is completely open, freely available on the web. The W3C members have early access to standards but once the standard is complete the results are public. The XML Working Group and the Working Groups for the supporting standards also release drafts of their work on a regular basis, making it possible to follow work in progress. Several non-W3C XML developments have also been extremely open. XML documents themselves are also considerably more open than their binary counterparts. Anyone can parse a well-formed XML document, and validate it if a DTD is provided. While companies may still create XML that behaves in a specific way bound to their application, the data in the XML document is available to any application. While developers could create DTDs or encrypt their data in a proprietary manner, they would lose most of the benefits of using XML. XML doesn't bar the creation of proprietary formats, but its openness is what many consider its greatest advantage. This openness leaves it vulnerable to attacks from malicious code and allows people to view data that would they would otherwise be unauthorized to view. One model used to regulate access to XML documents uses the XPath language. XPath is a language for addressing parts of an XML document. It models an XML document as a tree of nodes. An example would be a medical record like the following; the tree represents the XML document. XPath has absolute and relative location paths used for addressing. In addition to its use for addressing, XPath is also designed so that it has a natural subset that can be used for matching. The location paths that meet certain restrictions can be used as patterns. The development of the access control system requires the definitions of subjects and objects for which authorization rules are specified and access controls are enforced. A subject is a user with its own identifier, which can be the login name. Each user/subject can be the member of one or several groups. An object can be any node of an XPath tree. Authorization rules are formed by the set of subjects, set of objects, access and priority. The set of objects are expressed with a pattern, set of subjects is a location path, the value of access is either grant or deny and priority is optional and used to fix the priority of the authorization rule. The authorization rules are written on an XML Authorization Sheet (XAS). When a users request to see the XML source document then they are provided with the view of the document which is compatible with their rights. Here is and example that takes all the elements of the XPath language model. Patricia Franck is a new patient and has cancer. Her life expectancy is limited to two years and the item saying she has an ulcer is a cover story. The cover story is a lie inserted in the source document in order to hide the existence of sensitive information. The attribute coverstory=”yes” informs the users who are permitted to see that ulcer is a lie. Rule 5 says that the Franck family is permitted to see the data of Patricia Franck. Rule 6 says that the Franck family, including Patricia, is forbidden to see the comments element of her medical record. 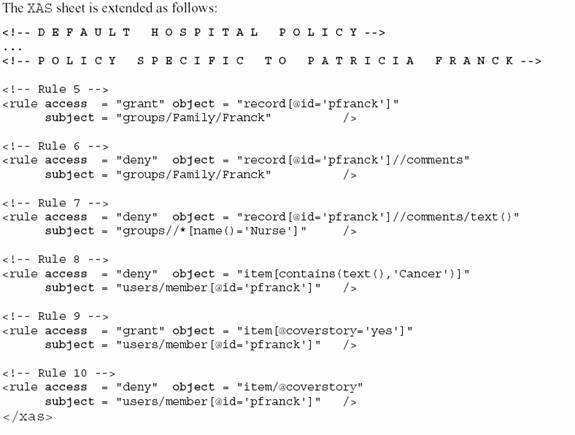 Rule 7 says that nurses are forbidden to see the text of the comments element of Patricia’s medical record. Rule 8 says Patricia is forbidden to see the item that says she has cancer. This is a good example of a content-based authorization rule. Rule 9 says that Patricia is permitted to see the item which is a cover store but rule 10 says she is forbidden to know the item is a cover story. This models allows security policies with a high expressive power since any node can be independently protected. The semantics and the possibility of defining content based authorization rules are unique. A broad family of initiatives and technologies are growing around XML, not just for desktop display but wireless, handheld and voice-based solutions, extending the predicament. The underlying philosophy of XML is to simplify integration of disparate platforms on an open systems basis, which is marvelous for simplicity and usability. Unfortunately the same levels of thoroughness and imagination have not been applied to security standards, which have not been optimized to the same degree. The requirements are demanding; it may well be that elements of a transaction forwarded to a third party need greater encryption than the rest of the communication. Measures are now being taken to address these issues and one of them, a digital signature system for XML, provides a means of certifying transactions and establishing an audit trail. This is particularly important for companies active in the business-to-business arena. While a small proportion of counterfeit transactions may be acceptable in business-to-consumer dealings, in the world of B2B commerce it is not.